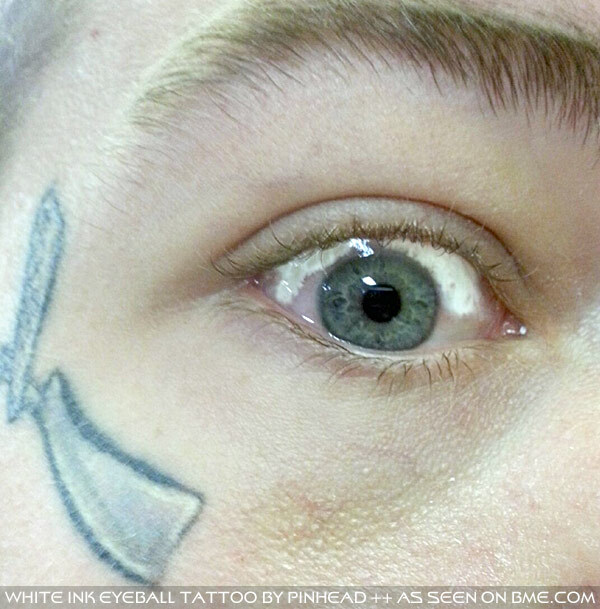 Pinhead in Florida (find him at Fat Mermaid in Fort Lauderdale) has done some more work on Dizzy’s white ink eyeball tattoo — something that I admit I didn’t initially think would work, but as you can see, wow, it works great and it makes him look like some sort of anime character. The look it produces is completely unreal — in Dizzy it looks cartoonish, especially with the other eye being bright blue, but I can imagine in someone else that it would make them look like an android, pushing them into the uncanny valley. 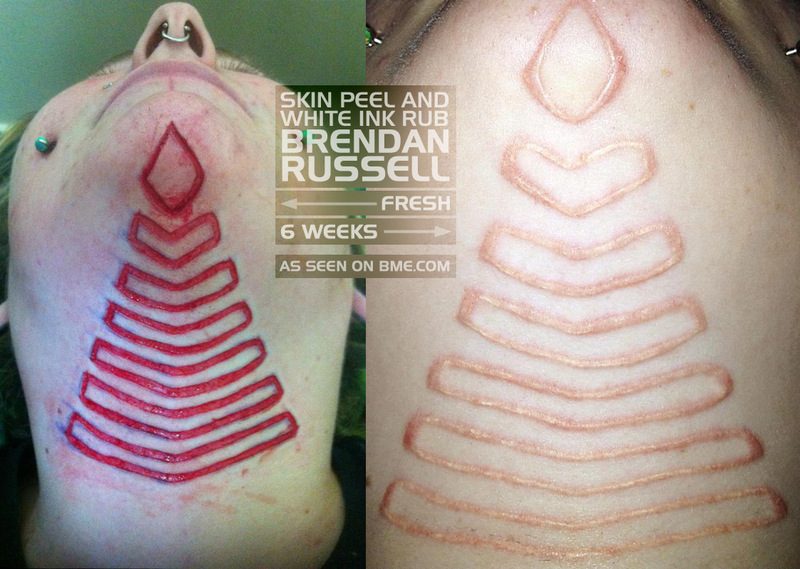 Cross-spectrum body modification artist Wayne Fredrickson of Zodiac Tattoo in Moreno Valley, CA — one of the few practitioners who’ve been featured here for tattoos (don’t miss that crazy link), piercing, and scarification — just posted a good example of how clean white tattoos often look, and how successfully they generally heal. It’s weird, even in these edumacaterd days, the urban myth persists that white ink tattoos are next-to-impossible to do, to keep from fading or changing color, or are even dangerous (someone emailed me just yesterday concerned because they’d been told that white ink is fundamentally toxic). 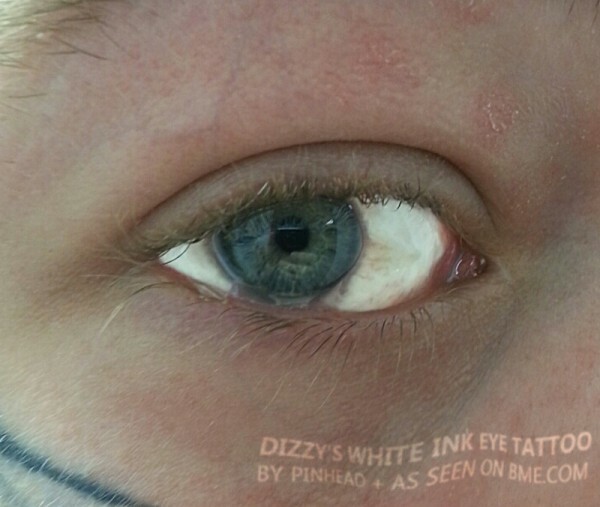 In reality white ink is as non-toxic and inert as any modern tattoo pigment (that is, safe to tattoo with, but a carcinogen if you spend a decade snorting large quantities of the pure powder base), and appears to last better than most, resistant to fading and other discoloration. In addition, when you’re talking about white-only tattoos, I feel like there’s some trick-of-the-eye that makes them more “forgiving” — slight breaks and imperfections in the linework are less likely to be caught by the eye, which makes them ideal for work on the palm for example, a location where it can be difficult to get ink of any color to stay perfectly (something which the eye instantly picks up on in black ink). In the example below, done on a palm (the location would have created more of a challenge than the choice of ink) you can see the tattoo progressing from fresh, to two weeks later, and finally to two months later. There’s no reason to believe that it will look nearly identical to that third shot two decades from now as well, although the lines may blur slightly due to the mechanics of skin. You may recall in November I actually posted a similar tattoo — click here to see a 13 year old white ink palm tattoo (that one is more yellow because of the pigmentation of the wearer’s skin, not because of its age). As usual, click the pic to zoom in. I’ve been posting pictures of Aaron Foster every few years since the start of ModBlog, most recently with a few other friends with white-striped faces. 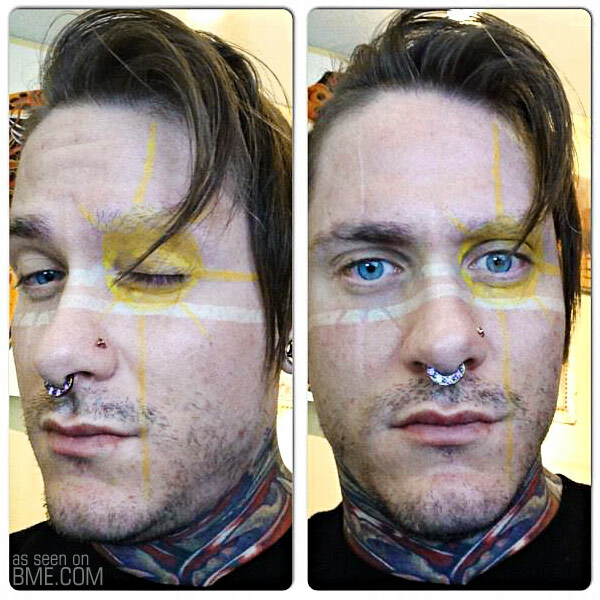 Since then he’s had Jason Maybruck add a burst of yellow to the white ink tattoo work that’s already there, a unique combination that I don’t think I’ve seen before, whether on a face or anywhere else on the body. Definitely very effective in continuing his sort of superhero theme! Watch out this summer by the way for a reality show tentatively titled “Unique Passions”, who filmed the tattoo. 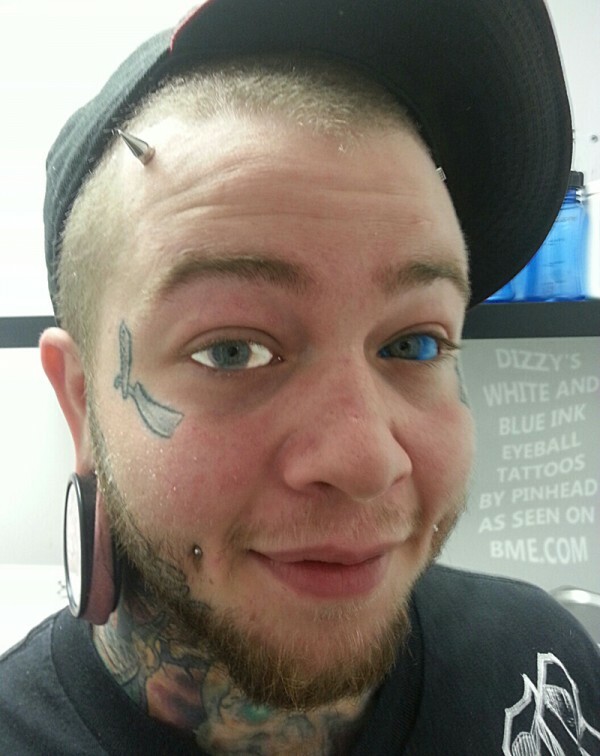 Well, well… I think I may have been proved wrong when I said that white ink eyeball tattoos wouldn’t work, or would at best make the eye look sickly. Pinhead did a few test injections of white ink — just baby injections over time to cautiously test the waters — and it turns out that it actually appears to work quite well (forcing me to add updating the FAQ to my already-too-long to-do list). In the photo below you can see the part of the eye that has been hit with white ink, and the parts that are untattooed. I should add that white ink is usually titanium oxide-based, which is a particularly inert pigment — and that’s a very good thing when you’re talking about putting it in your eye! 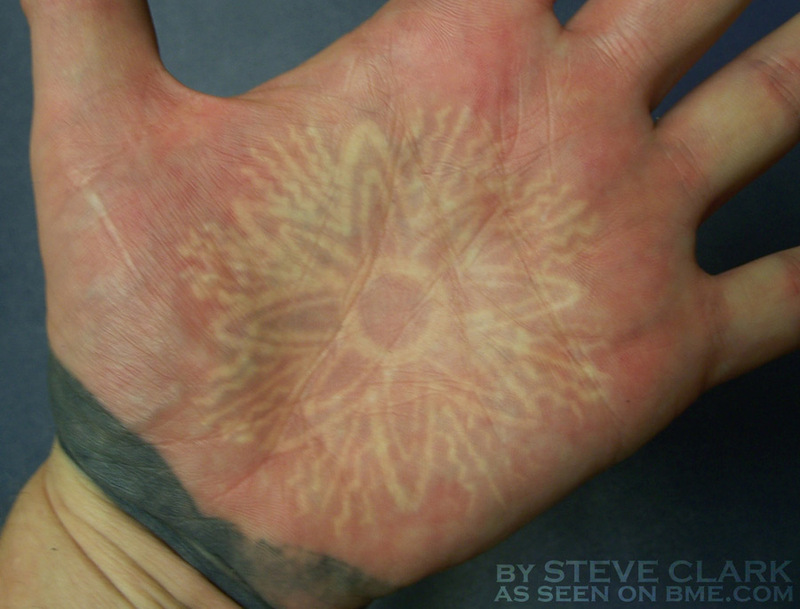 Thirteen years ago Lee got his hand tattooed by machine in white ink by Steve Clark (currently working at Phoenix Tattoo Studio in Raleigh, NC). Palm tattoos are troublesome at the best of times, let alone when in white ink (it’s not so much that white ink is hard to heal — it’s just that it’s more difficult for the artist to work with in general), but as you can see, almost a decade and a half later this tattoo is still remarkably solid. There’s a little variance in line weight, perhaps from Steve hitting the hand harder than he’d normally hit a tattoo to make sure it stayed in place, but the important thing is that it’s there. The yellowing simply reflects Lee’s skin tone — even if the ink is pure white, skin isn’t clear glass (otherwise humans would be freaky walking anatomical-model nightmare fuel) so tinting of this type is normal. 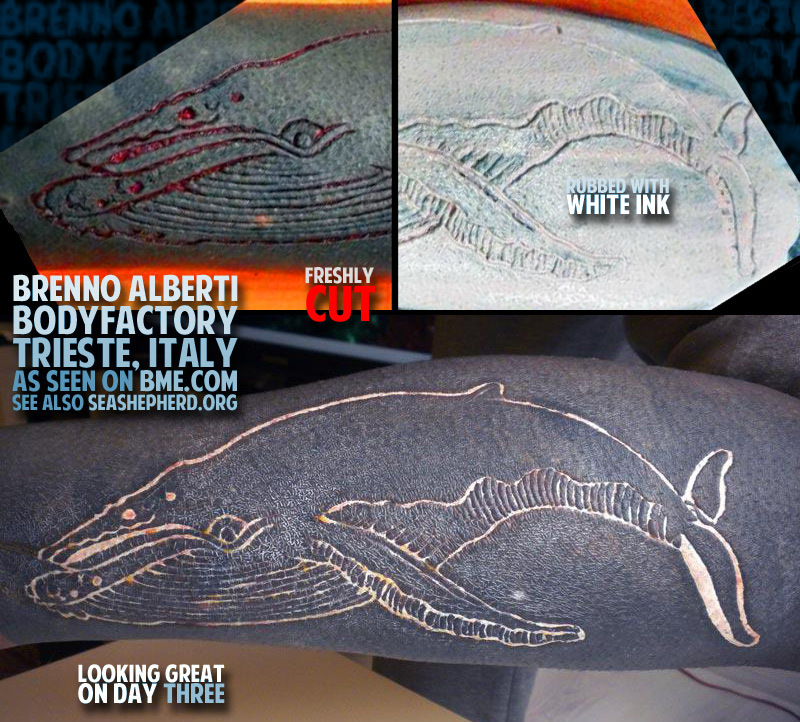 I have been watching this humpback whale scar by Brenno Alberti of BodyFactory in Trieste, Italy with great pleasure. First of all, because he’s pumped up the normal cutting over blackwork effect by a level by rubbing the cutting with white ink — I suspect this will be differentiated from normal cutting by the detail in the finer parts of the linework — but more importantly because I just love the design and it’s pristinely cut. By the way, sometimes it just amazes me how quickly scars heal — it looks so great on day three — but I suspect that with this piece the white ink is creating a bit of an illusion. By the way, I don’t have an ink rubbing of a humpback whale, but believe-it-or-not, but I have rubbed a humpback whale. Click the pic for a closer look. When I saw the healed tattoo on the right in the picture below, I actually thought it was fresh and commented on how much fresh white ink with black over blackwork looks “unreal”, like a sticker or a piece of body painting. To my surprise, the wearer informed me that it was not in fact fresh, but actually a week healed after being done by Gerhard Wiesbeck (timetravellingtattoo.com). You can see how much the colors have settled by comparing the fresh tattoo on the left — it’s more obvious in the white than in the black of course. In time the tones will lose a bit more contrast, but they won’t disappear — the biggest change happens in the first week. 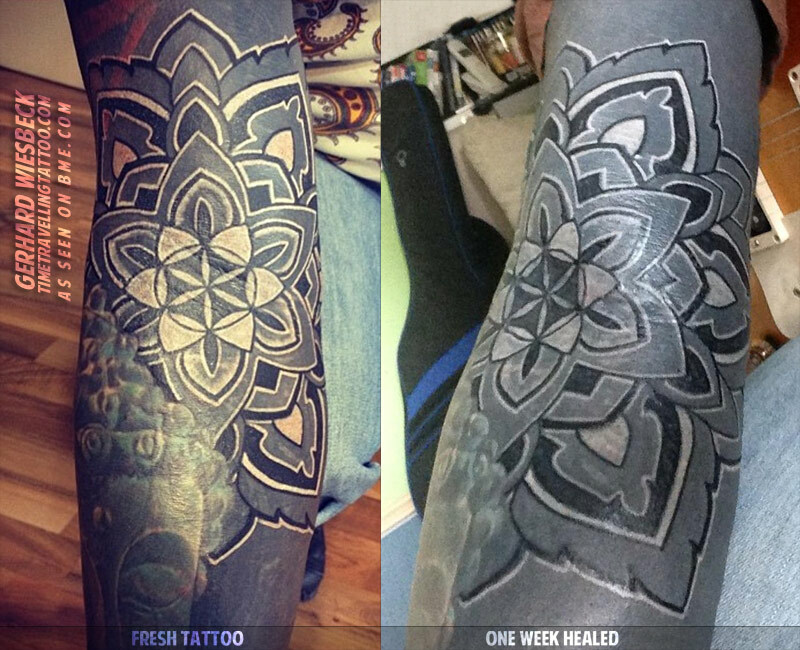 Check out ModBlog’s previous entries on this subject by following the “Tattooing Over Blackwork” tag — we’ve been showing you this technique for over five years now — and of course click the picture to zoom in and take a closer look. We’ve all seen white ink lettering tattoos before. 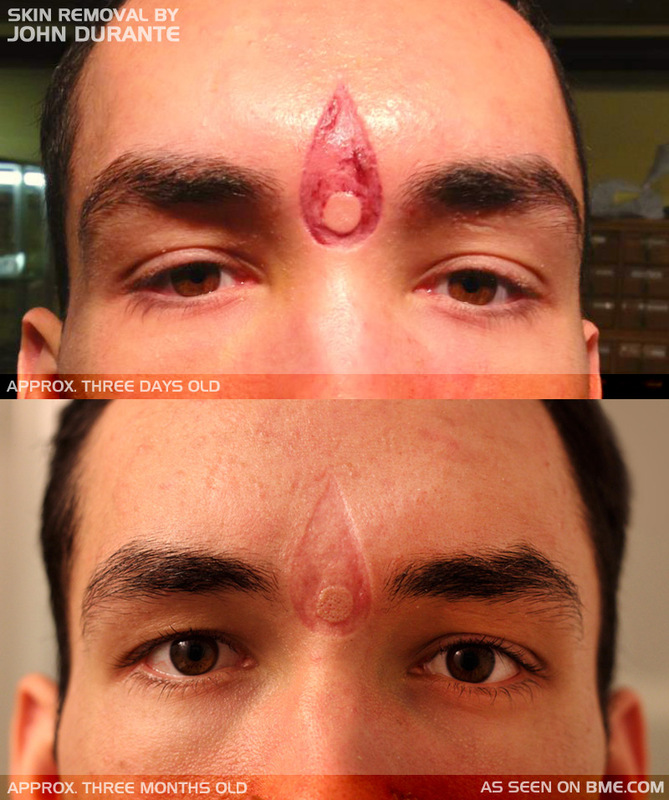 They’re easily visible when they’re fresh, but once they’re healed they almost fade into the skin. Depending on the angle and lighting they’re viewed they can look like a healed scar, or a mirage, appearing briefly then disappearing just as quickly. Which is why the word choice of this tattoo is so perfect.